I’ve just updated my Syncomatic plug-in to version 2.0. I’m happy with the standard method of importing files to LR on the desktop, and then to Lr Mobile, and I travel with a laptop. So I’ve never really thought about the problem of travelling with only an iPad and trying to process raw files with it. But others have been shooting raw+JPEG, importing the JPEGs into Lightroom Mobile on the iPad, applying star ratings and flags, and making some adjustments. After getting back to a real computer, they import the raw files into Lightroom as normal, and Lr Mobile would automatically bring in the JPEGs which were processed on the road. Unfortunately these JPEGs’ names no longer match the raw files. So in her book Victoria suggests renaming the files, which would allow Syncomatic to copy Library and Develop work from the JPEGs to the raw files, but quite sensibly she asked me if Syncomatic could avoid that messy renaming step. After all, the JPEGs’ capture times matched those of the raw files. 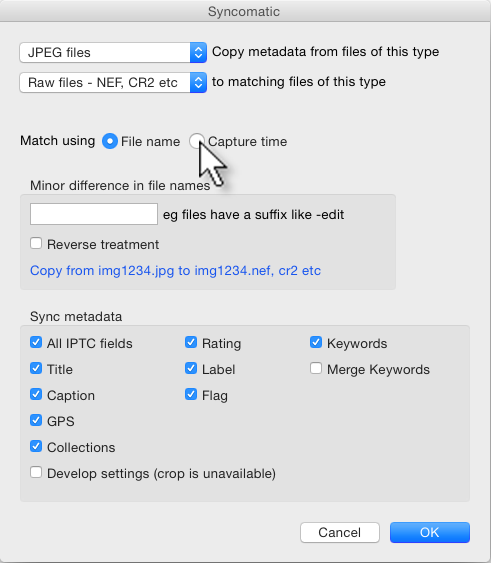 So Syncomatic 2.0’s new capture time option allows you to use the capture time to sync metadata and adjustments from JPEGs imported directly into Lr Mobile, and copy the work to the corresponding raw files. Isn’t it nice when people bring you great ideas? I’ve been using this a little and found a corner case that could use some improvement. If I’m shooting multiple pictures a second (common for me when shooting sports or live music) matching by date can cause multiple pictures to me updated by a single picture, as well as then those pictures being updated multiple times. I think I have a work-around of renaming my Lr Mobile pictures to match my DNG files (my naming convention includes the original photo number). Is it possible to add another matching pattern of the original photo numbers so I can skip the renaming step? Are the plans to include cropping? This is one of the few tweaks I would like to do on the iPad and sync back to the RAWs on the desktop pic. I absolutely do want to include cropping, Oli. Unfortunately Adobe don’t allow it. I have two ideas for workarounds, but neither is perfect and they are not going to be soon. Using a Lumia 1020 that shoots DNG and jpg, but only the jpg file gets GPS coordinates tagged. So this could be useful. You’ll need to test. That GPS will probably be in the EXIF data which I can’t normally synchronize because LR doesn’t let me write to EXIF fields, but there are also IPTC GPS fields and it’s possible to read/write these. Let me know and I can tweak the code if necessary.